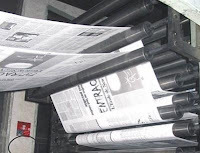 Could online ads save newspapers? Traditionally, news has always been supported by advertising. Newspapers worked on the assumption that quality journalism was costly to produce but they could still turn a profit by charging thousands for print ads. But this time-honoured link was broken by the unstoppable rise of the internet. Today, search engines like Google enjoy the lion's share of profits from online ads – including many of those on newspaper websites – leaving media executives desperately wondering how to make ends meet. Online ads – friend or foe? There can be little doubt that online ads are pretty unpopular in the newspaper industry right now. But ironically, could they ultimately help the Fourth Estate balance its books? Eric Schmidt, chief executive officer of Google, certainly thinks so and in a recent interview with Search Engine Land he argued that existing online ad models hold the key. According to Mr Schmidt, changes to how readers consume news will open up whole new avenues for behavioural targeting. He believes most people will switch from reading print to "personalised news-reading experiences on mobile-type devices" in the next decade or so. If that proves to be the case, it could mark the end of newspapers deciding what they think will interest their readers – instead, readers will simply choose for themselves. "That kind of news consumption will be very personal, very targeted," Mr Schmidt explained. "It will remember what you know. It will suggest things that you might want to know. It will have advertising." That last clause is crucial. It hardly needs to be said, but online marketers would jump at the chance to deliver highly-targeted ads to readers with a proven interest in their field. Does he read lots of finance news? Perhaps savings account ads may be of interest. Is he regularly scanning the sports pages? VIP match tickets might tickle his fancy. Or has he been trawling the motoring pages recently? He could well be in the market for a new car. Behavioural targeting with this degree of precision would attract a hefty premium. In September 2009, Google launched an experimental customer-facing tool that seeks to provide the best elements of print and online news. Google Fast Flip combines the instant page turns of newspapers with the internet's customisation and ability to learn what subjects, journalists and papers you enjoy reading. Display ads are placed alongside all articles and any revenue generated is shared between Google and the content producers. Mr Schmidt believes Fast Flip will open up new opportunities for display advertising. "We should be able to get very powerful advertising in display formats that people will like in this new model, invented, built and sold," he said. "Now I don't know how much revenue that is, but it's a lot more than they're getting now." Why is Google getting involved? Mr Schmidt said there were two reasons why the search engine giant wants to fix the black hole in newspaper budgets. Firstly, since Google's business model is built around improving access to content rather than producing anything itself, "we need these content partners to survive". And secondly, he argued that newspapers play an important democratic role so Google feels a "moral responsibility" to solve the funding problems it helped create. Whichever version you believe, one thing is clear. If projects like Google Fast Flip take off, we could soon see highly-targeted display ads placed in front of millions of former newspaper readers. And that would be a huge leap forward, both for newspapers and online marketers.